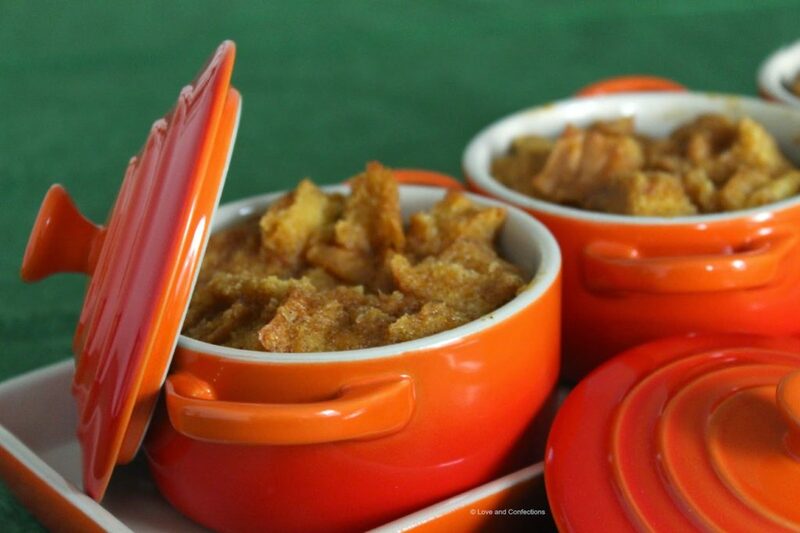 Pumpkin Pie Bread Pudding is an easy and delicious dessert to make – perfect for any holiday table! I absolutely love bread pudding. It is such an easy dessert and you can do nearly any flavor combination. You could even make a savory bread pudding and have it for breakfast, lunch or dinner. The options are only limited by your imagination. I have made Apple Pie Bread Pudding and Banana Bread Pudding before, but this is my first time making Pumpkin Pie Bread Pudding and it definitely won’t be my last. Delicious!! Individual servings are great for portion control and are pretty darn cute too. I love when everyone has their own ramekin or dish to eat from; it makes it feel a bit more special. 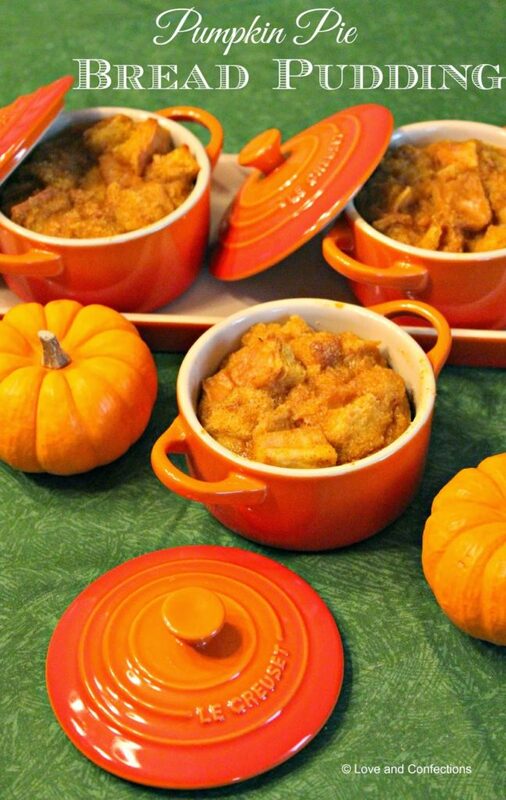 These gorgeous Le Creuset Cocottes were the perfect choice, and color, for my Pumpkin Pie Bread Pudding. This mini cocotte set is great for entertaining and making a special dish. You can also use them for Individual soups or stews. They fit snugly on the serving tray, and even though I am repeating myself, are so cute! I have always wanted some Le Creuset pieces. I have a teapot and these cocottes and can’t wait to continue and expand my Le Creuset collection. A Le Creuset Dutch Oven is still on my wish list, among many of their other gorgeous pieces. They also have so many beautiful colors for their cookware to choose from. Fun fact: the signature “Flame” color is the original color from Le Creuset and modeled after the bright orange color when creating the molten cast iron in a cauldron. I think my favorite colors are Palm, Caribbean, Lapis and Marseilles. They also have a Mini Cocotte Cookbook that I want to add to my ever-growing cookbook collection. You can read about the Le Creuset story here, and also browse their website to see the variety of products. Now here is the fun part: you can win your own set of Le Creuset 3 Mini Cocottes with Tray by entering the Rafflecopter below. 1. Cut Bread into 1/2 inch cubes and set aside. Whisk together the Sugar and Eggs in a large bowl. Add in the Cinnamon, Nutmeg, Allspice and Pumpkin Puree and whisk to combine. Add in the Milk and whisk together. 2. Add in the Heavy Cream, whisking just to combine it. You do not want to incorporate air into the cream. 3. Pour the bread cubes into the bowl and with the back of a spoon, make sure they are all submerged in the custard and leave to soak for about 30 minutes. Halfway through the soak, toss the cubes gently to make sure they are absorbing all the egg mixture. 4. While the bread soaks, heat oven to 300F. Prepare 6 cocottes by buttering the inside or lightly spraying with cooking spray. 5. Evenly distribute the soaked bread into the cocottes and bake for 35-45 minutes, or until the center is cooked completely when a skewer is inserted. Cool slightly before serving. Best served warm. 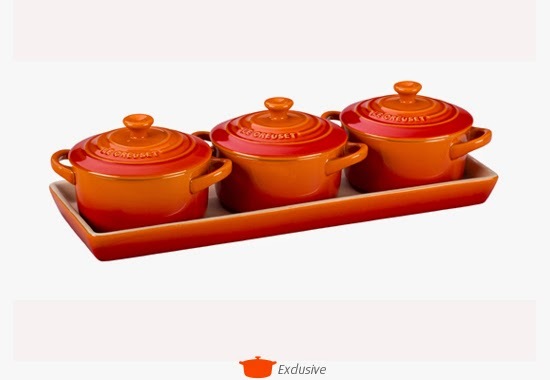 Disclaimer: I was provided the Le Creuset 3 Mini Cocottes with Tray for review. 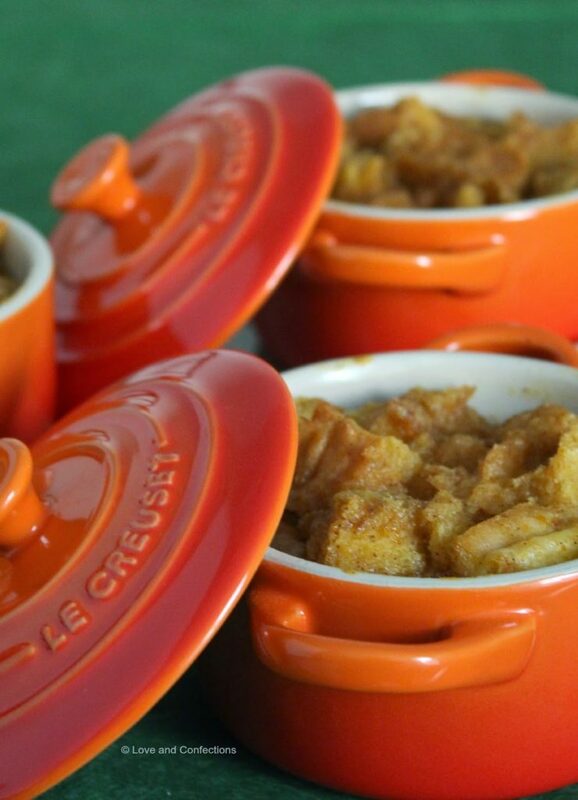 Le Creuset is providing a second set to give away to Love and Confections reader. All opinions are my own. ooo I love that green! I love Le Creuset, in fact just finished a pot of soup in my Dutch oven. I don't have a dutch oven, yet, but hopefully soon! I love the Apple Cocotte and think it would be fun to use. Flame is my favorite color. The apple cocotte is adorable! The amethyst flower cocette is just gorgeous!! Of course the little pumpkins for this time of year is perfect. My dutch oven from Le Creuset, that I absolutely adore, is red. Oh that's simple, because I actually have dreamt about it! – a 6 3/4 qt. Oval French Oven in the red that they call "Cherry". Sounds like you picked a good one! That would be perfect for all the holiday cooking! I adore my Le Creuset Dutch oven and would love to add more pieces to my collection. The new cream color is fabulous, it goes with everything! I dream of owning the Cherry Goosepot. I like the Heritage 18 oz. Square Dish in cherry. So pretty and perfect for Spring too. I'd love to own a round French oven in the Marseilles color. I would like the Heritage Bakeware Set in Marseilles. I love that set! The Round Casserole In blue. Love the 16-Piece Dinnerware Set in Cherry! I've been eyeing the French Oven in Soleil. I love the oval french oven in Cassis. I love their 5 1/2 french ovens!! Choosing a color is hard, I love them all! What a great giveaway! I have been wanting a piece of Le Creuset cookware…but haven't been able to justify the investment. It would be absolutely wonderful to win this giveaway. Flame is my favorite color. The 5 qt. braiser in palm would be a dream come true. I drool over all the colors and cookware..so hard to pick one color..I suppose the palm is my fave color and the covered 3.5 qt. caserol..but, I could change my mind..hahaha. I love the Camembert Baker in Flame! I like the 3 3/4 qt. Oval Casserole dish in the color white, so pretty. I love the round dutch oven in lapis! I'd love to have a set of cookware! In any color! I like the Heritage 4 qt oval casserole in royal blue because it matches our kitchen. Visited and I like the Heritage 1 1/10 qt. Rectangular Dish in Ocean.